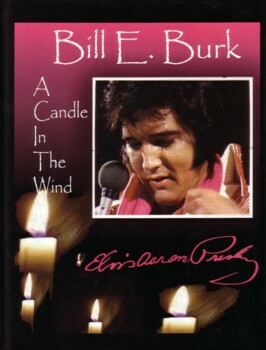 "Elvis Aaron Presley: A Candle In The Wind"
The latest coffee table photobook from Elvis World's "007", Bill E. Burk, is designed to please all fans. A nicely formatted balance of strong visuals and fascinating narrative, Elvis Aaron Presley: A Candle In The Wind (aka "Candle"), rates as one of the "must buy" releases of 2005. While Bill Burk complements the visual side of "Candle" with an authoritative and stimulating narrative, this element of the book is initially overshadowed by the many historically rare and stunning visuals which quickly attract your interest. However, written with Bill's customary flair and engaging style, "Candle" includes many great stories (eg. Elvis going to jail, his generosity to others, and first hand accounts of his relationships with early girlfriends like Anita Wood and Barbara Hearn). If you want to know what Elvis' female co-stars thought about him, then "Candle" is the book for you. Bill provides candid comments from Dolores Hart, Ann-Margret, Shelley Fabares, Mary Tyler Moore, Celeste Yarnall, Julie Parrish and Suzanna Leigh. Many female fans will drool over the numerous full-page color shots of Elvis performing live on stage in the 1970s or off-stage practising karate and riding "Rising Sun" at Graceland, but what impressed me the most were the just as impressive and historically very rare black and white visuals from the 1950s. Elvis' first ever publicity shot (with the future rock & roll King dressed in a tux with bow tie! ), the print advertisement featuring Elvis promoting the Memphis-based Hungerford Furniture Company, a fan photo snapped before Elvis walked out on stage at the Overton Park Shell stage on July 30, 1954, and a casually attired Elvis with school friend, Rosemary Barrocco, are only four of the very rare photos Bill Burk has secured for his latest book. There is also an eye catching early b&w visual of an attractive couple, Elvis with girlfriend Barbara Hearn, and some great photos in the section, Elvis in Deutschland (although we're sure Bill managed to slip in one visual actually from a few years later), not to mention photos from Elvis' Family Photo Album. Elvis with not one, but three Scandanavian princesses! The photos in "Candle" were sourced from various impressive collections, including Bob Heis, Keith Alverson, Robin Rosaaen, Bob Zimmerman and Wolfgang Hillenkoetter. The front cover photo is from the archives of Keith Alverson and noted Elvis sketch artist, Betty Harper, designed both the front and back covers. The hardcover, saddle stitched binding means "Candle" will last for many, many years. 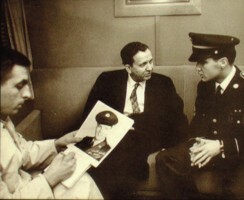 Verdict: The name Bill E. Burk has long been synonymous with solid, investigative reporting about Elvis and the discovery of rare items. Elvis Aaron Presley: A Candle In The Wind continues the Bill Burk tradition of providing fans with something special, something that adds value to both the narrative and pictorial history of the King of Rock & Roll. Recommended.